One of the hardest things to do after a great success is to follow it with an equally innovative idea. It’s hard enough to do it once, but twice? That is no small task. However, that is exactly what Arai is looking to do with their new Signet-Q Pro-Tour Helmets. New for this year is the Arai Signet-Q Pro-Tour Helmet, which keeps the same head shape and dimensions as the original, and will ship with the added functionality of a pre-installed Pro Shade system. The advantages of the external Pro Shade are more than a few in numbers. First, it is easy to operate and requires minimal effort to utilize. Simply make a subtle head nod and the shade moves into position when the light outside becomes a drain on your eyes. Even if you prefer a clear faceshield, the Pro Shade can simply be lifted into its upright position to act as a visor against the sun or if you are riding in a less illuminated are/time of day. In the end, however, the most important function of the Pro Shade would be that it allows for the helmet to retain a Snell safety rating as it does not alter the shell structure to accommodate visor internally. 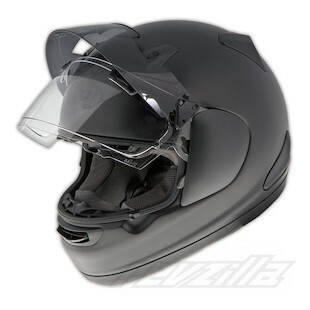 With an upgraded Eco-Pure liner for extended freshness and speaker pockets designed to better house communication accessories, the new Arai Signet-Q Pro-Tour helmet is focused on continuing to provide the best motorcycling experience in the market for riders with a long-oval head shape.